I've been writing in the last 2 newsletters about the 7 Physical Causes of Ill Health: a System of Healing Developed by Reverend Hanna Kroeger that can also prevent medical disease. In the newsletter for December 2016, I wrote about Congestion cause #2 in the 7 Physical Causes of Ill Health. In Last month's newsletter I wrote about Cause #6: Parasites. It occurred to me while I was writing about Cause #6 Parasites that to demonstrate the Energy Dynamics of the Body and barriers to cleansing anything like infections, parasites, chemicals, and feeling well that I should write about that "Spring" that is already in the air. Note that, the "Spring Being in the air" usually starts late January, early February, around the time of Chinese New Year. Yes. What occurs on March 21st or so has more to do with the Earth's Rotation and the way the Sun hits the earth. But it also occurred to me that now is also the best time of the year to get sick, not just because of the cold weather. And I want to explain to you how to stay well, and if you got sick what really works, and what to do/avoid to reduce your sick days. So, I'm going to write about the Liver Energy starting to help your liver, which makes you feel like "Spring is In the Air" and talk very specifically about keeping well during this the coldest time of the year in the Northern Hemisphere. Chinese Medicine says that the Liver begins to be charged in late January, early February. This is where the feeling of "Spring is In the Air" comes about. Even though all you may see outside is snow. It is a little known fact that people who purposefully awaken at 5:00am, or earlier, to start their day have more liver energy than others. And you need Liver Energy to Cleanse. You use up Liver Energy to Cleanse anything. When the Liver Energy starts charging up the Liver, you feel a great rush. You feel excited to be alive. You feel like there are no barriers to achieving anything in your life! Things are working smoothly in your body. That rush can feel like fast rise back to the apex of a roller coaster ride. It just feels so exhilarating! For a few brief weeks, you can feel like your hormones are in balance. Toxins are leaving your body more easily, subtlety and unbeknownst to you. In fact you could feel the happiest you have ever felt in the year. 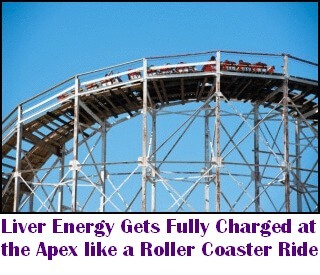 I liken the rush of Liver Energy charging to riding a roller coaster, as you start, then you go down, and then you feel the rush of riding up back up to the apex. You are always on this ride. The difficulty with finding out your Liver energy is sub-optimal though is because the roller coast ride takes one year. Can you remember what you felt like last year, and the year before around late January, early February? I love this image of riding up and down on a roller coaster, because just before "The Spring is In the Air" part occurs (the accent) occurs, you will also see that a week or two before, there is "Grumpiness in the Air." That's the valley of Low Liver Charging Energy we are waiting to climb out from in the Winter to get to the good feeling apex deep in the Spring. The speed or rush is more like an air-plane take off speed, but the initial slope is quite steep like in a roller coaster ascent which makes you feel like things are really changing fast. When I felt this rush of good feeling Liver Energy in late January, I went out expecting everyone to be happy and feeling exhilarated. I went out to go grocery shopping that day, went into the Supermarket, and expected everyone to look and feel happy. But half of what I saw was grumpiness. Unhappiness. Maybe even lethargy. I had to do a double-take of observation to see what was going on. So, how come I've got such good Liver Energy, and these few people I observed do not? Well of course, I've paid attention to Rebuilding, Re-energizing, and Restoring my organ function. 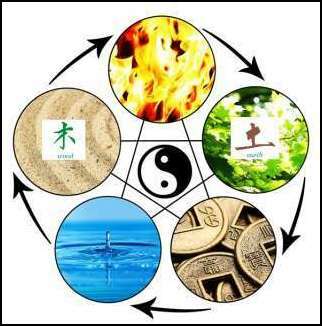 I've taken energetic supplements to improve my Liver Energy, and I've practiced Chinese Energy Healing: Qi-Gong when I can. And I can guarantee you that if you get your Organ Energy improved, life will be much better and easier for you. In fact doing that and getting all the metals, poisons, parasites, infections out and sustaining your Vitality and Liver Energy, taking the right life-long supplements, means you never have to worry or think about the Big-C coming, ever. What's Going On With Your Liver Energy? So, why do most people have insufficient or poor liver Energy? If I had to guess that statistically just 10% of people would have done cleanses, assuming they were done correctly, because they love the idea of Natural Healing and staying well, what's going on with the other 90% of the population? Especially people over 50 or 60? When your Liver Energy is insufficient to process toxins, you can be snappy, and be grumpy. That imbalance can be disastrous to the long-term health of your relationship! Your perceptions of people and things around you is altered, because your energy is not moving so smoothly inside. All of a sudden those driving speed bumps start bothering you. Other things you just took for granted start really bothering you. Does it really matter which way the toiler paper is dispensed? I see the cause of "Grumpiness in the Air" as people having to, year after year, detoxify everyday chemicals in their homes, work environments, spending too much time in new cars, detoxifying all the poisons there, breathing in poor quality air, lacking sufficient exercise, and never paying any attention to the Energetic Health of their Liver. In other words, typical Indoor air pollution. And this does not include any incidental mold spore exposure in your home, which can have a very profound obvious manifestation away from wellness. No, this Liver Energy reduction from wellness is insidious. It takes too long to notice, and is not easily observed. Everyone is too focused on cleansing, but not Rebuilding, Restoring, and Re-energizing the organs and glands! When you are in your 40s, you are given some clues as to the need for Liver Energy help. It's usually the fact that it gets a little harder to get out of bed in the morning, or you need more coffee to move your bowels (do people still do that)? Or your bowel movements come later on in the day, instead of just as you get out of bed. And so as you get into your 50s and 60s, most people get on medications, have mediocrely functioning colons, and Livers and the energy dysregulation gap between good health and mediocre health just widens and widens. Is the real cause ever discovered? Why is everyone focusing on getting all those B-Vitamins, and nutrients for Methylation purposes, when we hardly ever take care of the Energetic Imbalances that are more important and are the root cause of many disorders as well? Both would be even better at promoting health! And Acid reflux and heartburn are one of those medical difficulties that can show up when your liver is not energetically balanced. I believe it no coincidence that people escape to a vacation in the Caribbean and Mexico, and other hot zones closer to the equator on the same side of their Hemisphere in January, and February. In these more tropical spots, you can more easily detox. I think this works, as long as you don't pick up a hitchhiking intestinal critter, but you still have to work on your organ Energy in the long-term when your thyroid Energy is disturbed by travelling. And how about the fact that Blue Monday rests on the 3rd week in January when Liver Charging Energy is at its lowest? The bottom of the Roller Coaster Ride? Could this day have been so named, because of the roller coaster dip of Liver Energy? In TCM - Traditional Chinese Medicine, Wood is the element representing the Liver, because in Spring, Wood grows up from the ground. And in TCM the Liver is responsible for the smooth flow of Qi (Chi or Internal Energy), and the regulation of the mood. Many women who have difficult menses know the ups and down of mood that can result because of the demand placed on their livers. In my practice we use the best supplements to rebalance the Liver, and a Professional Formula: Wood Tonify from Systemic Formulas is one of them. Reverend Hanna Kroeger also created a wonderful and profoundly useful formula that is very specific in its purpose, the Formula Liver. It used to be called Livah. Maybe I should call it the "Grumpiness Solver", or the "Liver Charger?" Knowing a little bit about Reverend Hanna's Kroeger's sense of humor, her humanitarian nature, and the reasons she created her formulas, I can just imagine her on the telephone for several days in January, and seeing a pattern of women calling her up in and asking: "Do you also have anything for grumpiness?" So, both the Reverend Hanna's Liver Formula, and Doc Wheelright's Wood Tonify Formula are Vibrational, or Energetic Formulas. The herbs are combined in such a fashion to target the Liver. And the formulas are energetically balanced enough to be used in the long-term. It's also amazing how Emotional Disharmony can disappear when using the correct Liver Formula for a while at the right dosages. When that Liver Energy Rushes up and gives you that good feeling because the Organs work in a relationship, we can have a weakness in our Spleen as well. This is because the Liver will start restraining the Spleen Energetically. See the 5 Chinese Element Diagram showing the Liver - Wood on the left and the Spleen - Earth on the right. We say in the Spring Time, the Liver is exuberant, and becoming abundant. That's the rush of Liver Energy starting in late January. Technically in TCM we say the "Liver attacks the Spleen". And of course, that implies a possible difficulty if the Spleen is weak. Now the Spleen in Chinese Medicine encompasses both the pancreas (small case p) and the spleen (medical spleen). Both are part of the Organ System called the Spleen in Chinese Medicine. And we know the anatomical medical spleen is responsible for immunity, and is also part of the Lymphatic System. You know those lymph nodes ...that get very enlarged and painful in your neck sometime ago in your adolescence when you were fighting an infection? The tonsils are also part of the Lymphatics. Now do you remember when you had a viral infection, and the Doctor said do not consume milk products? That advice was given because they take so long to fully digest and your lymphatic system is busy cleaning house while the spleen and thymus fight an infection. Better advice would be to go easy on your Spleen. So, you basically want to leave your spleen and lymphatics alone and let it clear the infection. The tendency to get sicker this part of the year is one of us being in close proximity, but also because we are exposed to cold and weakened. And there is more susceptibility because of the Liver exerting its influence on to the Spleen. We have to be very vigilant about not letting the cold into our bodies. It sometimes does not take much. In spite of being well covered up while we travel in the cold. Scarves, hats, and more. So you can become more susceptible to the infections. It's not just a virus that we need to get sick. The virus has to get in and take hold. When it comes to pure juices by themselves, the worst you can drink are Pomegranate, Blueberry, and Cranberry. Although I have given you this list, you need to use your intuition about it. If you need the potassium, or help to move your bowels, by all means eat an orange. You need to eat nutritionally well for a cold or flu (more in a bit). But what I am saying is if you are relying on these kinds of fruits, Oranges, and Bananas, during a cold or flu you are probably going to prolong your cold or flu. That's because these foods are cooling, and not warming. If you could make a warm palatable smoothie with oranges and bananas and cinnamon (or ginger), or a pinch of nut-meg (because those are hot and warming respectively), you should do that. Some people use Ginger a lot during cold or flu season too. This is good too. Turmeric is warming! Reverend Hanna Kroeger published a cure for the cold, and it was boiling Apple Juice with cloves. Now that is medicine! I would recommend using cinnamon instead. The sweetness of the Apple Juice is beneficial to your spleen, while the cooling nature of the Apple Juice is balanced with the warming nature of the cloves/cinnamon. What Do You Eat To Prevent a Cold/Bacterial Infection: Stabilize Blood Sugar! In my adolescence I was told to drink Apple Juice (probably because of Vitamin-C), or other Juices, and eat lots of fresh fruit. It turns out that this advice will probably make the cold worse, let it in faster, and prolong the duration of the cold altogether. That's why a couple of years ago, I was hypothesizing that drinking juice during an infection (for nutrition or vitamin-C) was the worse thing a person could do because of the blood sugar spike. It may very well be proven that a blood sugar stabilizing meal will be just as useful for you as Echinacea tincture. That is because it leaves the pancreas to do less work (less insulin production) and the spleen to take care of the infection. I've found through my continued following of the Zone Diet (a Blood Sugar Stabilizing and fat Burning, Anti-inflammatory Diet) that I'm much less susceptible to getting a bacterial infection. I don't feel like a bacterial infection is going to take hold, and then several hours later, realize I'm in a full blown bacterial infection. And then ask myself, what just happened? That's always the way it happened to me in the past. But with the Zone Diet you have to eat at regular intervals. And it turns out the Spleen likes regular meals, and not skipping meals, or waiting 6 hours until your next meal. If in the winter, if we eat cold foods, cold drinks, and cooling foods, like oranges and bananas we invite our body to get sick. If we eat warm fully cooked soups, we assist our body in staying well. I believe a cold really happens because our immunity gets weakened by the warmth leaving our body (because of the cold getting in). It was the exposure that occurred one or two days before that caused the weakness, and you pick up whatever was around. That is why it is so important to wear warm footwear too at home in the Winter, and not walk on the floor even with just socks for a second, much less barefoot. Then the warmth won't leave the body, and make us more susceptible. This susceptibility all depends on your constitution. If you are hardy then maybe you can withstand a bit more cold than someone else who gets sick. Remember during a cold or flu, the weakness you felt, the loss of appetite? Sometimes the weakness is so profound, your stomach feels so weak. The cold or flu is very draining. The Spleen and Stomach work in harmony, so when one is weak, it shows up in the other. If the Spleen were very strong or full of energy, the cold or flu might not have taken hold. And you are advised to drink fluids, and eat soups when you have a poor appetite. Nothing too strenuous. That's because of your Spleen needing a rest. As I said, it will be busy fighting your infection, and you don't want to flog it into a worse state. One of my clients got sick with a terrible flu a few years ago, and was stuck in bed, and did not know what to eat. She probably did not know her avoid foods, and after an exposure to a virus and some cold, her immune system was not up to the task. She was left at home with no chicken soup, feeling weak, unable to cook, and a poor appetite. I suggested she go and buy a Rotisserie Chicken ASAP, and eat that, to get some protein. Vitamin-C is nice, but eating the right protein source is good to defeat a viral infection as well. Of course, chicken is a very bad protein source for Blood Type B's, so it needs to be avoided. She was an A. What is even better as I explained is having a meal that does not spike your Blood Sugar. That's why Juice, and eating too much fruit are considered Blood Sugar spikers, and are not the greatest for Healing a Cold or Flu. That's why they weaken you. Of course, if you really need that Juice, go ahead and have it. But warm it up. Don't eat anything cold at all during an infection. Don't drink cold water any time at all actually. Everyone wants to get rid of the cold or flu as soon as possible, and try to get well asap. So sometimes, people reach for a physiological remedy such as Oregano Oil which works great in a glass but not necessarily in the human body. Most of the time, you reach for Oregano Oil the moment you have symptoms of a cold. I'm sure it kills the virus in the body. But it has collateral effects. Oregano is cooling and needs to be balanced with warming medicinals, like cinnamon, garlic, ginger, and turmeric. Another way to say this plainly is: taking Oregano Oil long term can make you cold inside craving warmth. This is called depressing the Yang Energy, the warming energy in the body. So, If you take too much of it long term, you could get cold hands and cold feet. You will start craving those hot showers, and baths, warm foods. Sometimes after a draining cold or flu, you could look pale, and still feel weak. This may be an indication that your Yang Energy, Spleen and Kidneys were seriously drained. You did not recover to 100%. In fact you recovered to less than 50%, with fatigue, overall weakness, poor or disturbed digestion, dizziness, disturbed sleep. A little draft in the house feels like a strong outdoor wind. In that case you need Traditional Chinese herbal formulas and maybe acupuncture to help to fix the root problem.